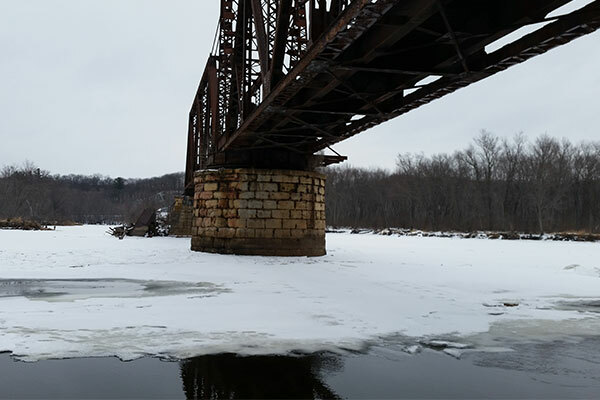 Kraemer completed an emergency pier repair of the Canadian National Railway bridge over the St. Croix River near Osceola, WI. A stone from the original built up piers had fallen out directly underneath the bearing area of the truss span thus requiring emergency repairs. Repairs included filling the void with concrete and additional substructure repairs to help prevent the issue from occurring again. Work included encasing two rest piers and one center drum pier in concrete to strengthen and solidify the substructure. In addition to substructure work, Kraemer removed and replaced all bearings, which included ring bearing removal. Ring bearing removal made the structure permanently fixed, with new ties installed across the entire bridge included as part of the project. Site access was restricted to hi-rail, which required Kraemer to use hi-rail concrete trucks for the concrete encasements as well as a hi-rail cable boom and knuckle boom trucks. This provided Kraemer crews with the ability to fill concrete forms and get material on site quickly and with greater ease.